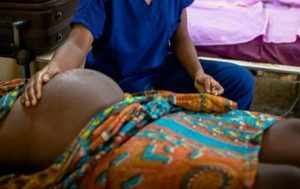 A young pastor who lost his wife and unborn baby at the Suntreso Government Hospital in the Ashanti Region has threatened to sue the hospital for possible negligence. He is blaming the death of his 30-year old wife, Angela Afriyie AgyemangÂ and his baby on negligence on the part of health workers who were on duty when she went into labour. Pastor Solomon Lamour Latif of the House Faith Ministry in Kumasi who was expecting his first child after one and half years of marriage narrated how health workers on duty at the Suntreso Government Hospital left his pregnant wife who was in deep pain to her fate to die. He alleged that before his wife’s death the doctor on duty whose name was only given as Dr. Sarpong, demanded a GHC 500 motivation fee for the cesarean session. Pastor Lamour Latif, who says he is disappointed in the countryâ€™s health system told Citi News he will take on the hospital over the death of his wife and baby. Management of the hospital have told Citi News the matter has been referred to the Ashanti Regional Health directorate. A similar incident occurred afterÂ a couple lost their twinÂ babies at the Tema General Hospital in 2010, as a result of alleged medical negligence. According to the couple, the hospital had failed to provide convincing answers on what caused the death of the babies more than seven years after the unfortunate incident. Father of the babies, Amankwah Addo, had threatened to sue the Hospital and the Ministry of Health if their concerns were not addressed. The post Pastor threaten to sue hospital after losing wife, unborn baby appeared first on Citi Newsroom.